Octogenarian Gerhard, who lives in Degeberga, near the city of Kristianstad, is a pensioner now, and he told how his interest in Bell began. “In September 1962 I studied a paper entitled ‘Shipbuilding and Shipping Record’, and it contained an article about the launching of the Comet replica,” he said. “This ship seemed interesting for me and I saved the pages, which showed photos and the lines. I saved them for eventual future use. 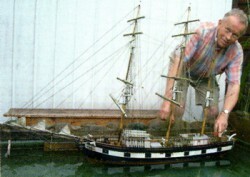 “Now I have converted from building real ships to ship models. Last spring it was time again to start another project and I discovered the Comet pages — now I would build something quite different! “I made a line plan, and from the many videos taken during the renovation of the replica from 2009-11 I got a lot of help. 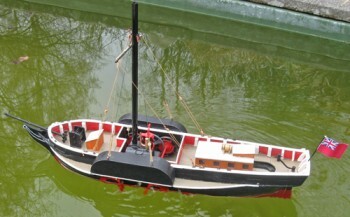 Gerhard tells visitors about his 46 cm long model, which has an electric motor in the boiler, and the story of Henry Bell and the Comet, and says that so far no-one has previously seen a paddle steamer with two wheels on each side. He launched his model again on August 4, and sent his best wishes for all the bicentenary events in Helensburgh. He has only visited Scotland once, at the end of the 1980s, when he was on a business trip to Glasgow and Edinburgh to look at the shipbuilding industry. He managed to fit in a bus tour of the Highlands, which he thought to be very nice. He added: "I always wished to repeat this excursion. Now it is too late. What I still can see now is my daughter's Highland Cattle — I like these animals!" 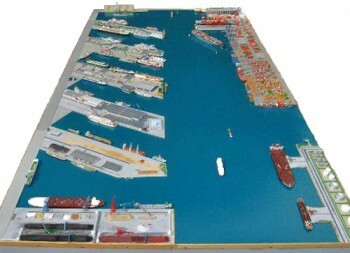 Gerhard added that ships are his life, and to mark his 80th birthday he unveiled his 1:1250 scale model of a harbour.